Hello, I’m Rich Fox, General Manager of Old Town Trolley of Key West. The sun, quaint setting, and clear waters of Key West have lured visitors since its settlement in 1822. For over 30 years, Old Town Trolley Tours has provided sightseeing tours highlighting the best Key West attractions. Hop aboard one of our trolleys and you’ll experience Transportainment, a delightful combination of transportation and entertainment. Our friendly conductors narrate the tour with a fascinating and fun mix of trivia and humorous stories. Spectacular sunsets, warm ocean breezes and a laid-back island atmosphere create the perfect setting for a budding romance or rekindling a long-term relationship. These are some of the enduring images and themes featured in many of Hollywood’s most romantic movies. Key West offers this and more. A favorite destination for royalty, political leaders and literary legends, this tropical oasis is an idyllic backdrop for a first date or special getaway celebrating a long-term relationship. Take that special someone on a romantic, unforgettable trip to experience attractions that allow couples to enjoy the sights while spending quality time together. Looming over Mallory Square near the Margaritaville Resort & Marina, the Custom House is an iconic Key West institution. An imposing four-story, red brick structure built in 1891, it’s a sight easily recognizable from land and sea. Originally home to Key West’s post office and district courts, today the Custom House is a fascinating museum run by the Key West Art & Historical Society. Their mission is to preserve the culture of the Florida Keys through the exhibition of art, architecture and history to educate the community and visitors. Planning a girls weekend in Key West? We’ve got you covered with everything from where to stay, what to eat, the hottest bars and the best activities on the island. While seasons matter when you’re planning a vacation in most places around the world, any time of the year is a great time to visit Key West. In the fall, the island cools off just a bit and beckons people from all walks of life to come experience its majesty. If you’re planning a vacation to the southernmost city in the fall, this guide will provide you with all you need to know. The Yankee Freedom III is the official ferry of the Dry Tortugas National Park. 70 miles from Key West at the Dry Tortugas National Park lies Fort Jefferson, the largest masonry structure in the western hemisphere. Aboard the Yankee Freedom guests will travel in air conditioned comfort, enjoy delicious breakfast and lunch, snorkel gear, showers and guided tours of this Civil War fort that has been called the eighth wonder of the world. If you are planning a Key West vacation, spending some quality time at the beach is a top priority on your travel itinerary. Boasting temperate waters and more than 3,400 hours of annual sunshine, the beaches of Key West are some of the most popular destinations on this tropical island paradise. You can enjoy the sun, sand and warm water as well as a variety of activities like swimming, snorkeling and fishing. Perhaps one of the most popular destinations on the island of Key West, Duval Street is the main drag of downtown, running north and south from the Gulf of Mexico to the Atlantic Ocean. Although it is not much more than a mile in length – this is where the heartbeat of the city comes to life in a diverse array of restaurants, shops, world famous pubs and attractions. Witness one of the world’s most majestic settings at Mallory Square. Here’s where everyone comes to see, eat, shop and linger. Buy a locally collected sea sponge, peruse a Wyland original in the gallery and stop in at the famous Hog’s Breath Saloon. Mallory Square is where it’s all at and where it all comes together. It’s also where the evening transforms into the renowned sunset celebration and when street performers, colorful entertainers and mouth-watering foods emerge as the sun begins to descend. Browse through the unique shops, pick up a souvenir at Ron Jon Surf Shop and see the local attractions. Find out what all the excitement is about. 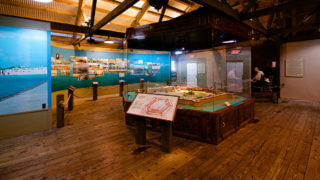 Designated a National Historic Landmark in 1973, Florida’s southernmost state park is popular for recreation, as well as U.S. military history. The fort was one of a series built in the mid-1800s to defend the nation’s southeastern coastline. Guided tours of the fort are available daily. Many find Key West strange during the day; but after the sun goes down, the restless souls of the island’s frightful past begin to stir. You will hear their tales that have been all but forgotten as you travel the narrow, dark streets of Old Town – filled with 19th century wooden houses that hold on to the secrets of their former inhabitants. Stories so tragic, so chilling, you’ll see why Key West is one of the top ten most haunted cities in America. Key West is a beautifully historic town filled with impressive attractions and sites. Maximize your time for sightseeing by taking Key West shore excursions from Old Town Trolley. Whether you take the tour purchased from your cruise excursions desk, or take the tour with on-and-off privileges purchased from Old Town Trolley directly, you will have time to shop, visit attractions, and find your way to some of our most famous landmarks. There’s always something happening in Key West and the year-round sunshine makes it easy to do it all! If you’re looking for a variety of fun things to do in Key West with family, the Southernmost City is a great place to go. Check out some of the most popular family activities on the island. Is there ever a bad time of year to visit Key West? Of course the answer is no; but springtime is one of the best times of year to head to this island paradise. The skies are sunny, the water is warm and the attitude is as welcoming as it always is. There is a ton of fun in store for you in the Southernmost City. Read on for the top things to do in Key West in the spring. Looking for the most efficient and entertaining way to visit many of the things to do in Key West with kids? Look no further because Old Town Trolley Tours offers parents a relaxing way to tour all the best Key West attractions for kids. Parents don’t have to worry about searching for directions to the Key West Aquarium, driving to White Street Pier and Higgs Beach, or finding parking while traveling from all of Key West’s best attractions. Our hop on and hop off trolley tours allow the parents to concentrate on having fun with their kids instead of worrying about logistics. It’s summer and there’s no place more exciting to be than in Key West. This tiny island paradise is one of the most unique places on earth, where people from all walks of life come to let loose and have an unforgettable experience. But it’s summer and it’s South Florida! It is a good idea to plan on visiting some of the indoor attractions and sights to stay cool.